Eating moderate amounts of ham, bacon and and red meat still raises the risk of bowel cancer, a major study suggests. Scientists compared the risk between people who stick to NHS guidelines on red and processed meat consumption – 70g a day – and those who don’t. 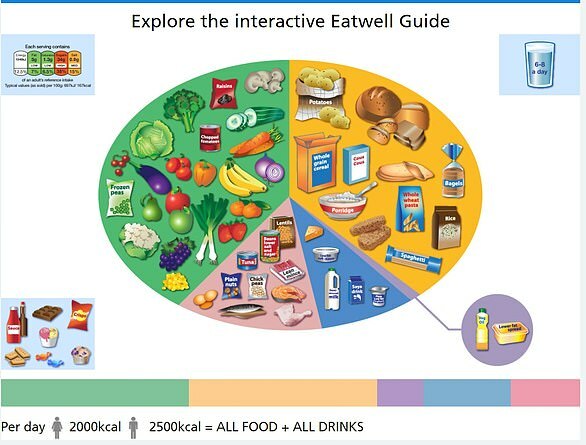 They found those who eat more than recommended face a fifth higher risk of bowel cancer, compared to those who eat smaller amounts. Researchers led by a team at the University of Oxford followed nearly 500,000 people for almost six years. Some 2,609 of the participants – who were aged between 40 and 69 at the start of the study – went on to develop bowel cancer, which is more common in older people. The study found people consuming an average of 76g per day of red and processed meat had a higher risk to those who ate 21g or less a day. For red meat only, the risk was around 15 per cent higher for people who ate 54g per day – a lamb chop, compared with those who had 8g per day. For processed meat only, the risk was 19 per cent higher for those who ate 29g per day – a slice of bacon, compared with those eating around 5g per day. Existing evidence points to a higher bowel cancer risk for every 50g of processed meat a person eats per day. But the new study found that risk increases at just 25g per day – a third of what the average daily intake is. Professor Tim Key co-authored the study and is deputy director at the University of Oxford’s cancer epidemiology unit. He said the results back the substantial evidence that link eating too much red and processed meats to a heightened risk of bowel cancer. Professor Key added: ‘Most previous research looked at people in the 1990s or earlier, and diets have changed significantly since then. WHO SAYS RED MEAT RAISES THE RISK OF BOWEL CANCER? Red meat – such as beef and lamb – ‘probably increases your risk of bowel cancer’, according to the NHS. And processed meats – like sausages and bacon – carry a similar risk. The NHS and American Institute of Cancer Research both recommend we limit our consumption to around 70g (2.4oz) a day. These recommendations came about after the 2011 Iron and Health report from the Scientific Advisory Committee on Nutrition concluded red and processed meat probably raise our bowel cancer risk. However, the report could not identify the exact amounts that are safe to eat. 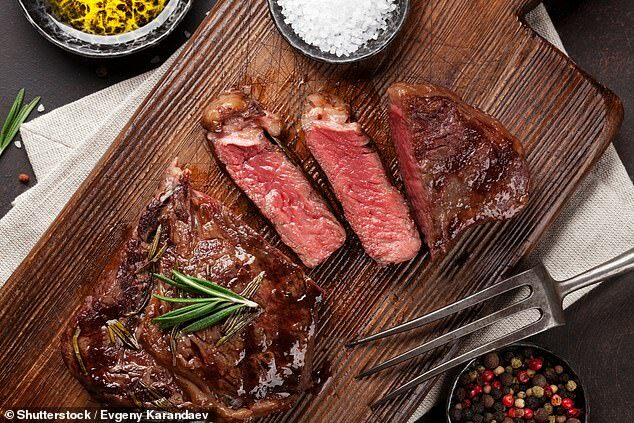 The same survey found the average UK adult eats 70g of red meat a day. The World Cancer Research Fund’s 2007 report Food, Nutrition, Physical Activity and the Prevention of Cancer also said the link between red meat and the disease is ‘convincing’. The NHS therefore recommends those eating 90g or more of red meat a day lower their intake to 70g. The World Cancer Research Fund already warns there is strong evidence that eating processed meat causes bowel cancer. An array of studies conducted in recent years have made the link between the killer disease and regularly eating salami, bacon and ham. Eating a lot of red meat, such as beef, lamb and pork, is also thought to increase the risk, according to the WCRF. The World Health Organisation classifies processed meat as carcinogenic and red meat as probably carcinogenic. In light of the evidence, the NHS and American Institute of Cancer Research both recommend consumption is limited to around 70g (2.4oz) a day. One rasher of bacon typically weighs 31g (1oz), a sausage is around 66g (2.3oz), and a slice of ham 20g (0.7oz). The latest study of meat and bowel cancer, part-funded by Cancer Research UK, was published in the International Journal of Epidemiology. Dr Julie Sharp, CRUK’s head of health information, said: ‘The Government guidelines on red and processed meat are general health advice. ‘This study is a reminder that the more you can cut down beyond this, the more you can lower your chances of developing bowel cancer. Dr Sharp added: ‘Although breaking habits we’ve had for a long time can be hard, it’s never too late to make healthy changes to our diet. Around 42,000 people are diagnosed with bowel cancer every year in the UK, says Bowel Cancer UK. And the killer disease affects around 40 per 100,000 adults each year in the US, according to the National Cancer Institute.